What good is a landscaping blog without a proverbial post about keeping your grass green? There are many elements to a well-designed and aesthetically pleasing yard, but there’s just something about a patch of perfectly green, healthy grass that draws in the human eye. It’s not uncommon for neighbors in an affluent subdivision to have passive-aggressive contests to see who can grow the greenest, most well-kept grass on the block. From a commercial landscaping standpoint, green grass may be a salesman for you in the sense that your business looks nice and customers are therefore more likely to walk in. Green Grass Is Beautiful — Let Gainesville’s Premier Landscaping Company Help! Whatever the case, everyone can appreciate a nice, healthy patch of grass (our apologies to those who are allergic to grass — at least you can appreciate the visual qualities of green grass from afar). The best part? Gainesville Lawnscaping will take care of the work for you thanks to our residential and commercial lawn care services. That’s right! From your home to your business, we offer comprehensive, worry-free landscaping services to all of Gainesville from Newberry to Lake Butler. Learn more about our commercial landscaping services or gain some lawn insight by reading below. The layer of undecomposed rhizomes, stolons, and stems on top of your grass is known as “thatch.” Essentially, this is a naturally occurring layer of mostly dead grass. Should your layer of thatch get too thick (more than about ½ inch), we’ll dethatch your lawn to help it breathe easier and absorb nutrients and water more efficiently. On average, the Gainesville area receives about 50 inches of rain per year — considerably more than the national average of 39 inches. As such, you probably won’t be relying on an irrigation system that would otherwise be necessary for drier climates. We’ll pay close attention to your lawn’s health, and make any adjustments in watering as we see fit. Generally speaking, fertilizer companies recommend applying lawn fertilizer in four main stages. Naturally, the timing of these stages varies on each region and climatic factors. While it’s easy to view your grass as one cohesive unit (i.e., a “lawn”), the reality is that there are millions of small but individual plants that must be attended to and fed. Our residential and commercial landscapers will make sure that your lawn is getting the perfect and balanced amount of fertilizer. Cut your grass too short and your lawn won’t respond very kindly. Conversely, growing a jungle of a lawn out on your front yard not only looks bad but could also spell problems down the road. Leaving a light layer of grass clippings right where they were cut can help provide valuable nutrients to your lawn, and the remaining clippings won’t be an eyesore, either. In any case, our commercial lawn care experts can adjust our blade heights anytime, anywhere. It’s your home and it’s your business. Take pride in these places! 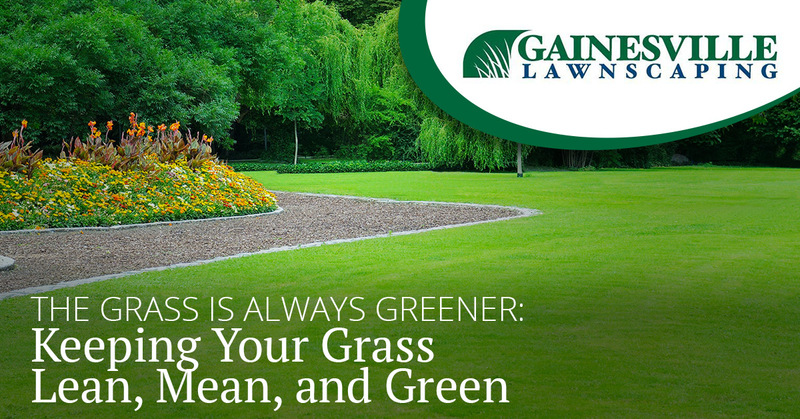 Contact Gainesville Lawnscaping today to set up a recurring commercial lawn care service. View Our Lawn Care Specials Here!